The 2010 Abu Dhabi Grand Prix (formally the Etihad Airways Abu Dhabi Grand Prix) was a Formula One motor race held on 14 November 2010 at the Yas Marina Circuit on Yas Island, an island on the outskirts of Abu Dhabi in the United Arab Emirates. It was the 19th and last round of the 2010 Formula One season. The 55-lap race was won by Red Bull driver Sebastian Vettel after starting from pole position. Lewis Hamilton finished second in a McLaren, and teammate Jenson Button completed the podium, in third place. A second race win in succession – as well as a second consecutive Abu Dhabi Grand Prix win – for Vettel, coupled with other championship contenders Hamilton, Fernando Alonso and Mark Webber finishing second, seventh and eighth respectively, allowed him to become the youngest World Drivers' Champion, at the age of 23 years, 134 days. Button's third place allowed him to finish fifth in the championship standings, having been eliminated from championship contention at the previous race in Brazil. Due to injuries sustained in a rally crash prior to the 2011 Formula One season, this was the last Formula One race for Robert Kubica until his return in 2019. Heading into the final race of the season, Ferrari driver Fernando Alonso was leading the Drivers' Championship with 246 points; Red Bull drivers Mark Webber and Sebastian Vettel were second and third on 238 points and 231 points respectively. McLaren's Lewis Hamilton was also in mathematical contention on 222 points, 24 behind Alonso with a maximum of 25 points available for the final race. As a result, this was the first occasion that four drivers still had a chance of winning the Drivers' Championship at the final event of the season. In the Constructors' Championship, Red Bull Racing had already secured their first championship title with a total of 469 points, 48 clear of second-placed McLaren with a maximum of 43 points available. McLaren were themselves not confirmed in second place in the championship, with a 32-point advantage over Ferrari. To interfere with the drivers was never a possibility for us. The whole world condemned Ferrari after what they did in Hockenheim, but we have turned out as idiots because we did not act in this way. We never even thought about it as long as both our drivers remain in the hunt for the championship. It is not assured that Alonso will always be the lucky one. Abu Dhabi will be incredibly exciting and provide highest tension. Sunday night we will know if we clinched the other 50 percent and have been successful or not. A second place under correct circumstances might be better than a win on grounds of orders and confirmations. Red Bull team owner Dietrich Mateschitz, on team orders. Much of the media coverage occurring before the event was centred upon Red Bull, and the possibility of team orders being used to influence the result of the championship – if the team was in the position to do so – as had been used by Ferrari at the German Grand Prix. Ferrari used radio transmissions to allow Fernando Alonso to overtake teammate Felipe Massa for the race victory and gain seven extra points towards the Drivers' Championship. Team owner Dietrich Mateschitz and team principal Christian Horner both stated that Red Bull would not impose any team orders in order to benefit one of its drivers in a bid to stop Alonso from winning the championship. Sebastian Vettel himself had stated that he would help his teammate win the championship if required, having trailed Mark Webber by seven points heading into the weekend. After 242 races since their full-time return in 1997, tyre supplier Bridgestone bowed out of Formula One, having been the sport's single tyre supplier since Michelin pulled out after the 2006 season. Pirelli took over the tyre contract in 2011, returning to Formula One for the first time since 1991. Three practice sessions were held before the race; the first on Friday afternoon and the second on Friday evening. Both sessions lasted 90 minutes. The third session was held on Saturday afternoon and lasted an hour. All three sessions were held in dry conditions, although the first session was held on a damp but drying track after a pre-session downpour which had not been anticipated. Vettel was quickest with a time of 1:42.760 in the first session, just over six-tenths of a second faster than Hamilton. Button was another four tenths off Hamilton's pace, followed by Webber, Robert Kubica, and Alonso. Michael Schumacher was seventh, the only other driver to be within 1.5 seconds of Vettel's time. In the second practice session, Hamilton was fastest with a time of 1:40.888, around a quarter of a second quicker than second-placed Vettel. Alonso took third place, ahead of Webber, Kubica and Felipe Massa. Schumacher was only quick enough for eleventh position in the session, marginally slower than his Mercedes teammate Nico Rosberg. The Saturday afternoon session was held on a much warmer track, which reached temperatures as high as 43 °C (109 °F), compared with 29 °C (84 °F) and 31 °C (88 °F) track temperatures for the Friday sessions. Vettel was again quickest, posting a time of 1:40.696, narrowly faster than teammate Webber. Hamilton, Alonso, Button and Vitaly Petrov rounded out the top six positions. Sebastian Vettel set the fastest time in the last two parts of the qualifying session, and started from pole position. His tenth pole position of the season enabled his Red Bull team to tie McLaren's single-season record of 15 pole positions, set during the 1988 season. The qualifying session held on Saturday evening was split into three parts. The first part ran for 20 minutes and eliminated the cars from qualifying that finished the session 18th or lower. The second part of qualifying lasted 15 minutes and eliminated cars that finished in positions 11 to 17. The final part of qualifying determined the positions from first to tenth, and decided pole position. Cars which competed in the final session of qualifying were not allowed to change tyres before the race, and as such started the race on the tyres that they set their quickest lap on. I'm not rapped to be fifth on the grid, it's disappointing, but there's still a long way to go tomorrow – the fat lady hasn't sung yet. I would like to have been further up, but I couldn't get the pace. We need to be there at the end of tomorrow's race and a lot can still happen; I haven't helped things today, but the championship's not decided today. I didn't seem to have the grip the other guys had and I need to have a look where I was losing time. We will just have to do the best job we can tomorrow, it's a long race – we're still in the hunt and that's the main thing. Mark Webber, following the third qualifying session, in which he qualified the farthest back of the four title contenders, in fifth. Vettel clinched his tenth pole position for the season, with a time of 1:39.394. As a result, Vettel became only the seventh driver to record ten pole positions in a season, and took his team's 15th pole of the season, equalling McLaren's tally from the 1988 season. He was joined on the front row of the grid by Hamilton. Alonso qualified third, though he was happy with his grid position having outqualified Webber. Button qualified fourth, four-tenths of a second behind Vettel, and Webber qualified fifth. Massa, Rubens Barrichello, Schumacher, Rosberg and Petrov rounded out the top ten. Kubica only managed 11th – missing out on the top ten for the only time in 2010 – having struggled with overall grip in the session. Kamui Kobayashi was best of the Saubers in 12th, ahead of the German trio of Adrian Sutil, Nick Heidfeld and Nico Hülkenberg, with Vitantonio Liuzzi qualifying 16th. The rest of the grid was made up by the Toro Rossos, the Lotuses, the Virgins and the Hispanias. Michael Schumacher's spin and resultant collision with Vitantonio Liuzzi brought out the safety car on the first lap. The conditions on the grid were dry before the race, the air temperature at 29 °C (84 °F), track temperature at 33 °C (91 °F); and no rain expected. The race's formation lap commenced at 17:00 local time (UTC+4), with all 24 drivers getting away cleanly. Vettel retained his pole position lead into the first corner, followed by Hamilton, with Button moving into third after Alonso made a slow start. At turn six, Schumacher tried to pass teammate Rosberg around the outside, while battling for eighth position. Schumacher spun his Mercedes, which meant he faced the rest of the oncoming field on track and was collected by Liuzzi, causing both drivers to retire on the spot and the safety car to be deployed. In order to aid any losses that a pit stop may have cost under normal racing conditions, six drivers – Rosberg, Petrov, Jaime Alguersuari, Bruno Senna, Lucas di Grassi and Christian Klien – made pit stops at the end of lap one, and rejoined the circuit between 17th and 22nd. Racing resumed at the end of lap five when the safety car pulled into the pit-lane. The top five remained static until the end of lap eleven. Webber – who brushed the armco with the right-hand side of his car three laps previously – pitted after struggling for grip on the super-soft, option tyres. He rejoined the circuit 16th, and behind the early-stopping trio of Rosberg, Petrov and Alguersuari. Four laps later, Alonso also brushed the Turn 19 barrier before pitting. He rejoined just in front of Webber, who had moved up the field steadily, and was running 13th – and set the race's fastest lap at the time – by the time Alonso pitted. Vettel and Hamilton continued to set quicker lap times than their championship rivals, despite being on heavily worn option tyres compared to the fresher, hard tyres of Alonso and Webber. That pairing caught up with Petrov towards the end of lap 18, a battle that would go on until the race's conclusion, with the Renault driver having already stopped for tyres. Five laps later, Alonso tried to overtake Petrov under braking for Turn 11 but had to back out of the manoeuvre, narrowly avoiding the back of the Renault. On the same lap, Hamilton pitted from second place. Vettel pitted from the lead on the next lap, and rejoined the circuit comfortably ahead of Hamilton, but in second place behind Button, who had still to stop on track. Hamilton had filtered back into the race in fifth position, behind Kubica and Kobayashi who were running similar strategies to Button out front. After passing Kobayashi, Hamilton closed in behind Kubica but found it hard to pass the Renault, akin to what Alonso had been suffering behind Petrov. Despite having nearly 40 laps on the harder tyre, Kubica's pace was still of a substantial level to hold off the advances of Hamilton. Button pitted on lap 39 to release Vettel back into the lead, holding a lead of nearly twelve seconds over Kubica. Button rejoined in fourth place behind Kubica and Hamilton, with Kubica ever increasing his margin over Petrov and Alonso, who were running inside the points again in seventh and eighth respectively. Kubica finally pitted on lap 46 from second place, and came back on track in sixth place, crucially ahead of teammate Petrov, Alonso and Webber; the latter pair seeing their championship chances dwindling with every passing lap. In clean air, Hamilton set the race's fastest lap on lap 47 – 1:41.274 – as he closed slightly on Vettel. No further passing attempts were made on track, and thus, Vettel led the race to the end, to take his fifth win of the season. The McLarens of Hamilton and Button completed the podium ahead of Rosberg, the Renaults of Kubica and Petrov, Alonso and Webber. Rounding out the points were Alguersuari and Massa, the Ferrari driver having never got ahead of his rival in 40 laps of battling. With the poor results of Alonso and Webber, Vettel claimed the championship to become the youngest Championship winner in the sport and became the first driver to simultaneously lead the championship for the first time, and as a result win the championship since James Hunt in 1976. His championship-winning margin was four points over Alonso, with Webber a further ten points behind in third. Lewis Hamilton's record for being the youngest Championship winner in 2008 was broken by Sebastian Vettel. At 23 years, 134 days, Vettel broke Hamilton's record by 166 days. After the race it is always very easy to see the best strategy. As I said now you need to cover from someone and if we didn't stop I think Webber probably would have overtaken us, if we stopped we cover from Webber but let Petrov and Rosberg in front so it was a very difficult call I think. It was obviously a tough difficult race. I lost a position at the start and then when the first safety car came out Petrov and Rosberg came in so... We saw some problems with the soft tyres, Webber pitted and then we tried to cover from him. When you cover someone probably you give something away to the others. So it was then a choice between covering Vettel or Petrov and Rosberg, so we covered Webber and then it was difficult to overtake Petrov. The Renault is very quick on the top speed so it was a frustrating race behind him. But this is a sport, this is motor racing. Sometimes you win, sometimes you lose. Championship runner-up Fernando Alonso, summing up his race and his chances of his third championship disappearing. Hamilton praised his team for all their work during the season, stating that "we pushed very hard throughout the year, so a big thank to all the guys back home at the factory for not giving up. Next year will be a better year." Button echoed Hamilton's comments about the work of his McLaren team, and summed up his first season with the team: "I would like to say a big thank you to the team. This is my first year with the team and I have had a great season. I really feel at home and I think the experiences we have gained this year, Lewis and myself, with working closely with the engineers and everyone in the Vodafone McLaren Mercedes team means we can really build on this season for next year." Due to the change of the scoring system in 2010, Sebastian Vettel broke the record for most points in a season (as did 4 other drivers) with 256 and Red Bull-Renault broke the record for most constructor's points in a season (as did 2 other teams) with 498. Bold text indicates the 2010 World Champions. ^ a b c "2010 Formula 1 Etihad Airways Abu Dhabi Grand Prix (Race)". formula1.com. Formula One Administration. 14 November 2010. Retrieved 11 August 2013. ^ "World Motor Sport Council, 11/12/2009". fia.com. Fédération Internationale de l'Automobile. 11 December 2009. Archived from the original on 22 November 2010. Retrieved 12 November 2010. ^ a b c Ornstein, David (14 November 2010). "Sebastian Vettel wins Abu Dhabi GP to capture F1 title". BBC Sport. BBC. Archived from the original on 15 November 2010. Retrieved 14 November 2010. ^ Benson, Andrew (7 November 2010). "Sebastian Vettel wins in Brazil to keep title race alive". BBC Sport. Autódromo José Carlos Pace, São Paulo: BBC. Archived from the original on 11 November 2010. Retrieved 18 November 2010. ^ a b "The title permutations – who must do what to become champion?". formula1.com. Formula One Administration. 13 November 2010. Archived from the original on 14 November 2010. Retrieved 17 November 2010. ^ Casey, Michael (13 November 2010). "Four-way title battle 'fantastic' for F1 says Bernie Ecclestone, as Fernando Alonso leads way". The Scotsman. Yas Marina Circuit, Abu Dhabi: Johnston Press. Archived from the original on 5 December 2010. Retrieved 17 November 2010. ^ Tremayne, David (8 November 2010). "Red Bull refuse to use team orders leaving Alonso in pole to take title". The Independent. Autódromo José Carlos Pace, São Paulo: Independent Print Limited. Archived from the original on 11 November 2010. Retrieved 17 November 2010. ^ a b Kuntschik, Gerhard; Elizalde, Pablo (9 November 2010). "Mateschitz against Red Bull team orders". autosport.com. Haymarket Publications. Retrieved 18 November 2010. ^ Noble, Jonathan (11 November 2010). "Vettel and Webber free to 'give it all'". autosport.com. Haymarket Publications. Retrieved 18 November 2010. ^ Noble, Jonathan (11 November 2010). 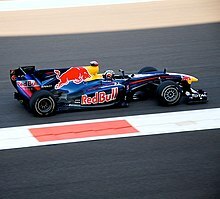 "Vettel gives firmest hint on Webber help". autosport.com. Haymarket Publications. Retrieved 18 November 2010. ^ "Bridgestone heads to Abu Dhabi for final race of the 2010 F1 season". Bridgestone Motorsport. Bridgestone. 9 November 2010. Archived from the original on 16 November 2010. Retrieved 17 November 2010. ^ "Bridgestone on their first season as sole tyre supplier". formula1.com. Formula One Administration. 18 October 2007. Retrieved 17 November 2010. ^ "Pirelli tyres, adjustable rear wings among 2011 changes". formula1.com. Formula One Administration. 23 June 2010. Retrieved 17 November 2010. ^ a b "2010 Formula One Sporting Regulations" (PDF). fia.com. Fédération Internationale de l'Automobile. 23 June 2010. Retrieved 17 November 2010. ^ a b English, Steven (12 November 2010). "Vettel leads first Abu Dhabi practice". autosport.com. Haymarket Publications. Retrieved 19 November 2010. ^ a b English, Steven (12 November 2010). "Hamilton quickest in practice two". autosport.com. Haymarket Publications. Retrieved 19 November 2010. ^ Hughes, Emlyn; Creighton, Geoff (13 November 2010). "As it happened: Saturday Afternoon Practice". autosport.com. Haymarket Publications. Retrieved 19 November 2010. ^ Croft, David (Commentator); Davidson, Anthony (Commentator) (12 November 2010). Formula 1: The Abu Dhabi Grand Prix – First Practice Live. BBC Sport. Yas Marina Circuit, Abu Dhabi: BBC. Event occurs at 00:00:55–00:01:15. ^ Croft, David (Commentator); Davidson, Anthony (Commentator) (12 November 2010). Formula 1: The Abu Dhabi Grand Prix – Second Practice Live. BBC Sport. Yas Marina Circuit, Abu Dhabi: BBC. Event occurs at 00:00:55–00:01:10. ^ a b English, Steven (13 November 2010). "Vettel leads final practice in Abu Dhabi". autosport.com. Haymarket Publications. Retrieved 20 November 2010. ^ a b "Vettel gives Red Bull a boost with pole position at Abu Dhabi". France 24. 13 November 2010. Archived from the original on 28 November 2010. Retrieved 19 November 2010. ^ a b c "Qualifying – selected team and driver quotes". formula1.com. Formula One Administration. 13 November 2010. Retrieved 19 November 2010. ^ McKenzie, Lee (Interviewer); Webber, Mark (Driver) (13 November 2010). Formula 1: The Abu Dhabi Grand Prix – Qualifying Live. BBC Sport. Yas Marina Circuit, Abu Dhabi: BBC. Event occurs at 01:48:05–01:48:55. ^ Parkes, Ian (13 November 2010). "Vettel takes pole in Abu Dhabi showdown". The Independent. Independent Print Limited. Press Association. Retrieved 19 November 2010. ^ a b English, Steven (13 November 2010). "Vettel takes crucial Abu Dhabi pole". autosport.com. Haymarket Publications. Retrieved 19 November 2010. ^ a b "Vettel takes vital Yas Marina pole". formula1.com. Formula One Administration. 13 November 2010. Archived from the original on 1 December 2010. Retrieved 19 November 2010. ^ a b Legard, Jonathan (Commentator) (14 November 2010). Formula 1: The Abu Dhabi Grand Prix – Race Live. BBC Sport. Yas Marina Circuit, Abu Dhabi: BBC. Event occurs at 00:43:30–00:43:45. ^ a b c d e f Hughes, Emlyn; Creighton, Geoff (14 November 2010). "As it happened: Race day at Yas Marina". autosport.com. Haymarket Publications. Retrieved 18 November 2010. ^ Hughes, Emlyn (14 November 2010). "As it happened: Abu Dhabi Grand Prix Weather". autosport.com. Haymarket Publications. Retrieved 19 November 2010. Conditions will remain dry and clear throughout the rest of the evening and the eagerly anticipated race day will begin dry with clear skies. But, as we have seen over the past two days, there will be a slight risk of an isolated shower towards midday... That said, things are highly likely to stay dry throughout tomorrow, with increasing sunshine towards the early evening start time. ^ "Abu Dhabi Sunday quotes: Mercedes". autosport.com. Haymarket Publications. 14 November 2010. Retrieved 18 November 2010. ^ Legard, Jonathan (Commentator); Brundle, Martin (Commentator) (14 November 2010). Formula 1: The Abu Dhabi Grand Prix – Race Live. BBC Sport. Yas Marina Circuit, Abu Dhabi: BBC. Event occurs at 00:51:40–00:52:10. ^ a b c d e f g "2010 Formula 1 Etihad Airways Abu Dhabi Grand Prix – Pit Stop Summary". formula1.com. Formula One Administration. 14 November 2010. Retrieved 19 November 2010. ^ Legard, Jonathan (Commentator); Brundle, Martin (Commentator) (14 November 2010). Formula 1: The Abu Dhabi Grand Prix – Race Live. BBC Sport. Yas Marina Circuit, Abu Dhabi: BBC. Event occurs at 01:09:25–01:09:45. ^ Legard, Jonathan (Commentator); Brundle, Martin (Commentator) (14 November 2010). Formula 1: The Abu Dhabi Grand Prix – Race Live. BBC Sport. Yas Marina Circuit, Abu Dhabi: BBC. Event occurs at 02:03:20–02:03:50. ^ "2010 Formula 1 Etihad Airways Abu Dhabi Grand Prix – Fastest Lap Summary". formula1.com. Formula One Administration. 14 November 2010. Retrieved 19 November 2010. ^ a b c Hughes, Mark (18 November 2010). "Vettel keeps his head". Autosport. Haymarket Publications. 202 (7): 32–43. ^ Brundle, Martin (15 November 2010). "The best man won the F1 title, says Martin Brundle". BBC Sport. BBC. Archived from the original on 2 December 2010. Retrieved 19 November 2010. ^ Strang, Simon (14 November 2010). "Defeated Alonso defends pit strategy". autosport.com. Haymarket Publications. Retrieved 19 November 2010. ^ a b c d "FIA post-race press conference – Abu Dhabi". formula1.com. Formula One Administration. 14 November 2010. Retrieved 19 November 2010. ^ "2010 Formula 1 Etihad Airways Abu Dhabi Grand Prix – Qualifying Results". formula1.com. Archived from the original on 11 November 2014. Retrieved 28 December 2015. ^ "2010 Formula 1 Etihad Airways Abu Dhabi Grand Prix – Race Results". formula1.com. Archived from the original on 16 March 2010. Retrieved 28 December 2015. ^ a b "Abu Dhabi 2010 - Championship • STATS F1". www.statsf1.com. Retrieved 5 March 2019. Wikimedia Commons has media related to 2010 Abu Dhabi Grand Prix.